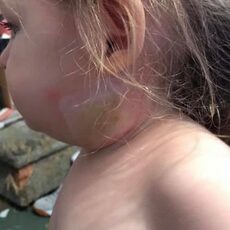 A cystic hygroma, (CH) also known as cystic lymphangioma and macrocytic lymphatic malformation) LM), is an often congenital multiloculated lymphatic lesion that can arise anywhere, but is classically found in the left posterior triangle of the neck and armpits. This is the most common form of lymphangioma. 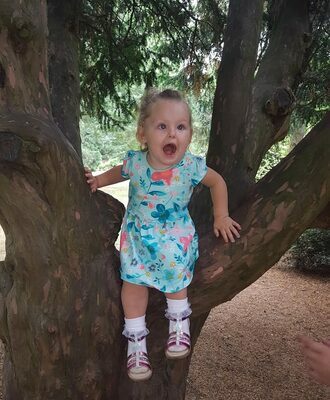 Ezmae-Kate was born with Cystic Hygroma and she is the most delightful little minx you could every wish to meet. 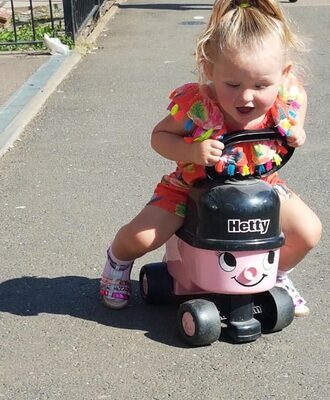 I can say this because I am proud that she is my great granddaughter. 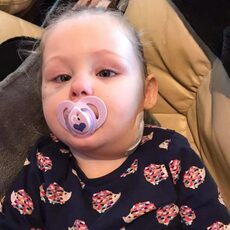 Her Cystic Hygroma was not picked up in the womb through all the baby scans and although it was obvious at birth it wasn't officially diagnosed until the second day of her life. 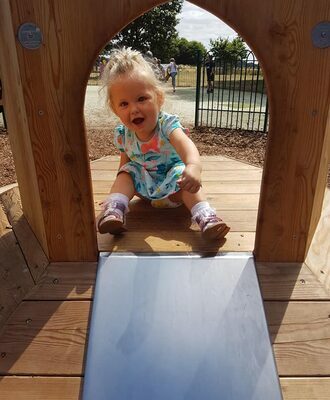 She was referred to Birmingham Children’s Hospital and her Mum was told that she would be two before any treatment would take place. 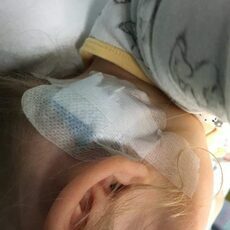 Some days her CH is not that visible but if she becomes poorly or upset it is more visible. The photographs on this page will show her journey at different stages of CH, but also shows how happy our little minx is and how she has a full and active life for her age. The lymphatic system forms part of the immune system that identifies and fights off invaders, such as bacteria and viruses consisting of a network of vessels within the body through which lymph circulates, and many lymph nodes which filter the lymph fluid and help the body fight infection. 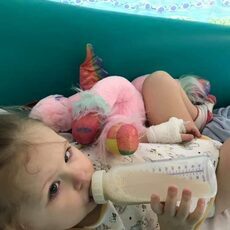 In Ezmae-Kate's case the lymphatic vessels did not develop properly in the womb. Nobody knows why this happened, nobody is to blame and this couldn't have been prevented. What does LM look like? 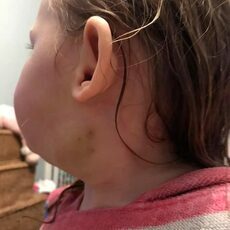 From the initial photographs you will see that in Ezmae-Kate's case it appears to be one big swelling. Eventually as the swelling went down you could feel little cysts under her skin. Sometimes they would feel soft and spongy other times they would feel quite hard. 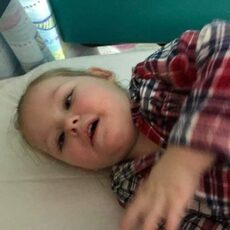 Some days to the untrained eye it would hardly be visible and on the days when she isn't feeling well or upset then it is far more prominent. 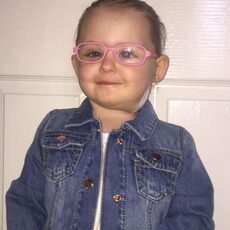 We had a name for Ezmae Kate's swelling from the beginning, however at a later date she underwent diagnostic tests and scans to confirm the diagnosis and although it was called a CH at birth it wasn't until the scans were done that the term LM was used. 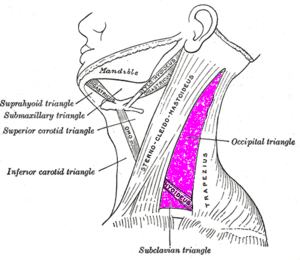 The scans enabled us to understand the extent of the lymphatic malformation. I think diagnosis for any young family must be very scary and cause a lot of anxiety. 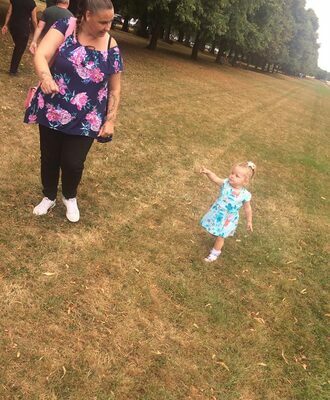 I know that my Granddaughter, Ezmae-Kate's Mum blamed herself and it took a lot of reassuring from the family that this was not her fault. 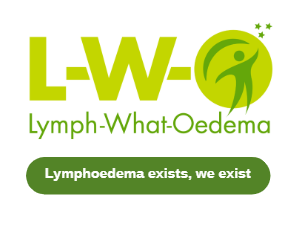 However, as a family because of what I do in running L-W-O we were able to research and have a better understanding of LM than someone who hasn't had our experience with Lymphoedema and the Lymphatic System. Which is why raising awareness is important. 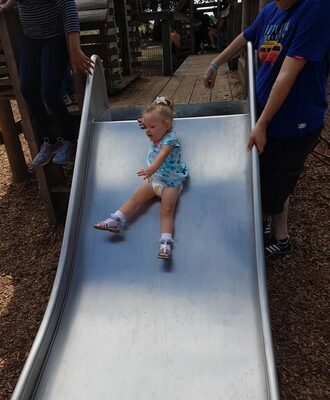 As a family we have been very lucky that Ezmae-Kate so far hasn't had many complications. 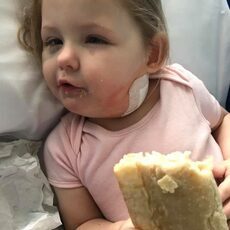 She has had no trouble feeding however, her breathing can sometimes be ragged especially at night, whether this would be more or less than any other child of her age is difficult to tell. 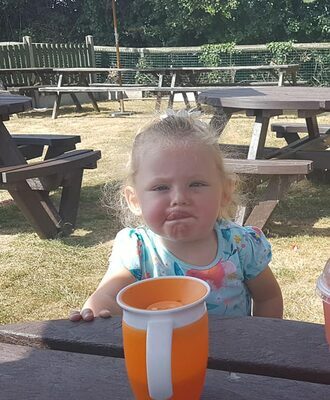 Occasionally she gets a lump inside her mouth, but at this stage it hasn't caused too many problems. We know that cutting down salt, drinking lots of fluids and making sure she has a healthy diet is important. Good skin-care is essential and trying to keep her skin clean and well moisturised is so important. 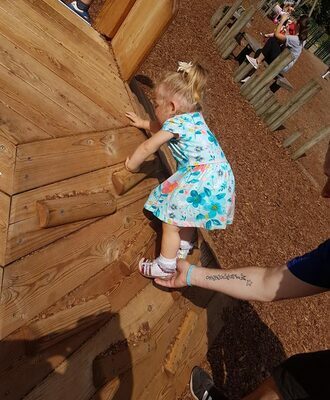 We are also aware that she is two and into absolutely everything, so 'play dirt' is part of the territory so are the falls, bruises, cuts and grazes. Because she is two exercise or movement is not a problem because she never stops. 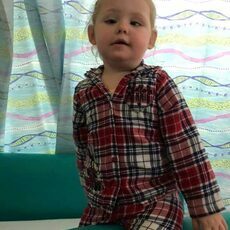 So far Ezmae-Kate has undergone two LS procedures under general anaesthetic with a gap of two months between each procedure at Birmingham Children's Hospital by an interventional radiologist. 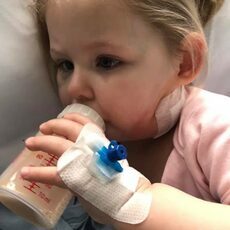 The first procedure produced some swelling which took about two weeks to go down with very little bruising, but she did experience what seemed like some paralysis in her left arm. Difficult to tell with a little one, but she had a few days where she couldn't pick things up or hold things in her hand and this probably lasted about a week, but she didn't complain and as adults I think we were more worried than she was. The second procedure was done recently and swelling, and bruising was significantly increased. Too early to say how quickly this will go down. I will update you when I know more. My understanding is that the third procedure might not take place as Ezmae-Kate has been referred to the clinic. Interventional radiology is a radiology specialty which provides minimally invasive image-guided diagnosis and treatment of disease. Although the range of procedures performed by interventional radiologists is broad, the unifying concept behind these procedures is the application of image guidance and minimally invasive techniques in order to minimize risk to the patient. At this time we don't know if Ezmae-Kate will need any more procedures. We will wait and see. What I can say is that she is the most lovable little minx and lights up my life every time I see her. "As you may know Kathy is passionate about raising awareness of lymphoedema and is currently in Washington DC lobbying for funds and education. She carries a small book of pictures of lymphedema patients from far and wide and uses it to educate and gain attention for the cause. 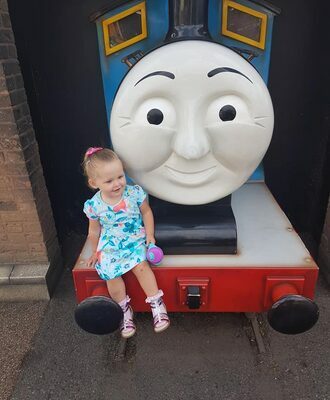 She has asked me to find some more pictures for her and I came across the pictures of lovely little Ezmae-Kate on Twitter. May I have permission to print a couple of the pictures for Kathy's book? They will not be published anywhere but just used to show and educate." L-W-O has a children's support group, supporting children who live with lymphoedema and lymphatic malformations. 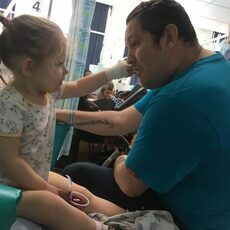 We currently have 45 families on board with a wide range of lymphatic conditions. 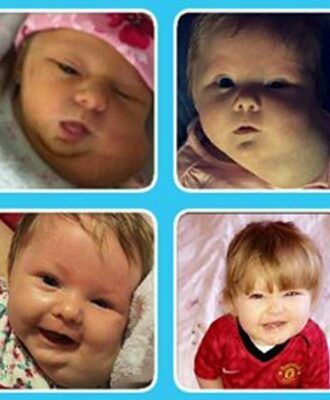 There are four children living with CH, two from the UK, one from Australia and one from the US.